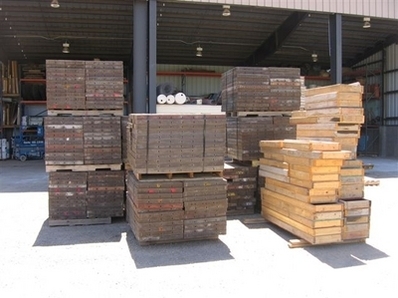 Large Inventory, Multiple Locations, Huge Variety of wall formwork, fillers & hardware, all in good condition. 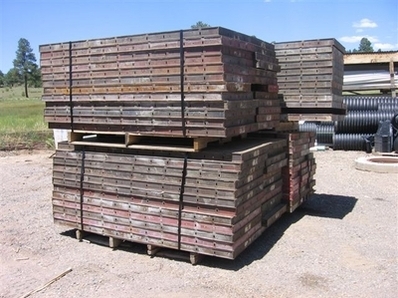 Reach our Sales Department for Great Pricing on used Symons Steel-Ply concrete wall forms & hardware. Steel Strongbacks & Splice Channels. The installation of Safety Eyes on Symons Steel-Ply panels allows easy attachment of safety belts while working on the forms, though work platforms are recommended and normally provide more efficient working conditions. The Symons Steel-Ply components and accessories illustrated herein have been designed with safety and performance in mind to help achieve a safe and productive forming operation. The maximum allowable pour pressure for the Symons Steel-Ply system is 1000 psf. Steel‑Ply standard handles are designed to be used to assist in manually transporting or positioning each modular panel, and should not be used as a means of attachment or for any other purpose. 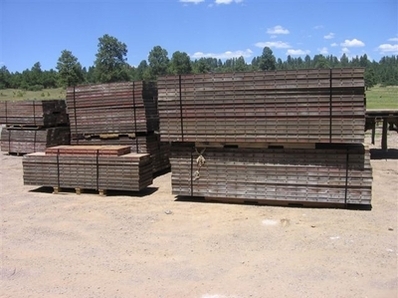 Symons Steel-Ply Fillers are manufactured from the same steel and plywood as panels, and are available in all even inch widths from 4" to 22" and 5". The Symons Steel-Ply panels on the opposite side would be automatically aligned parallel to the previously walered job-built forms. Attach Pilaster Braces with Symons Steel-Ply Wedge Bolts at the panels and a Short Bolt at the Pilaster Form. The Symons Pipe Form Aligner is adjustable from 11'-7" up to 20'-9" and connects to side rails by utilizing the Steel-Ply Pipe Form Aligner adapter at the Wedge Bolt slot midway between crossmembers. In most applications, nailing through the backside of the Steel-Ply panel plywood is required to hold the bottom of the boxout tight against the form face. The Beam Pocket is nailed to the Steel-Ply form to provide a ledge in the finished concrete for an 8" deep steel beam to set on. Footing, pad and slab forming with Steel-Ply is made easy with the Footing Corner Bracket and the Stake Plate. Two Footing Corner Brackets at each corner, one on top and one on the bottom, hold the panels firmly and at virtually any dimension that your job requires (2" increments). The Stake Plates are then positioned along the top edge of the Steel‑Ply panels as needed for steel stakes to hold the forms in place against the concrete pressure. Either ¾" round or I‑beam steel stakes can be used with the Stake Plate. 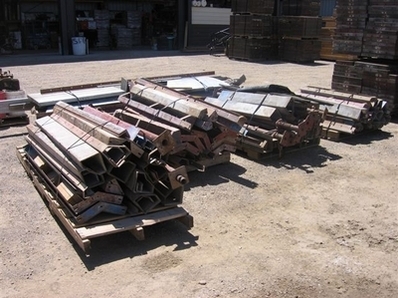 The Stake Plates can be located midway between Symons Steel‑Ply crossmembers and end rails to provide access for a stake puller.